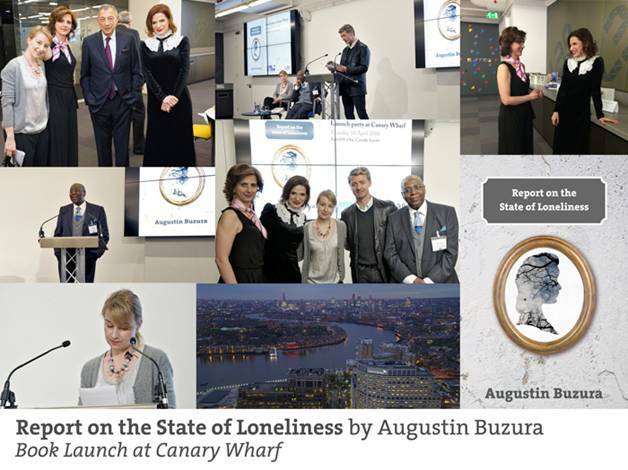 Profusion Books launched the first translation in English of Augustin Buzura’s “Report on the State of Loneliness”, on 18 April 2016 in London, at Level39, Canary Wharf, with the kind support of Sir George Iacobescu. Augustin Buzura is one of the best-loved and respected Romanian authors, with a career as a journalist, novelist, and cultural manager spanning more than fifty years, and “Report on the State of Loneliness” is his first novel published in the United Kingdom. The book was introduced by Dr Mike Phillips OBE, Profusion director, accompanied by his fellow director, Ramona Mitrica, who told the audience about the days when, as a young graduate, she worked as Buzura’s assistant. Due to health issues, the author himself was unable to travel to London, but his daughter Ada Buzura, who came in his place, spoke affectingly, about his reputation, his work and about growing up in a ‘house of whispers’. Distinguished London based Romanian actors, Annamaria Marinca (Meg Mathias in the Welsh TV drama Hinterland), and Gabriel Constantin (Monsieur Philippe in the forthcoming TV series Victoria), then read extracts from the book. Among the guests were Sir George Iacobescu CBE, CEO of Canary Wharf, architect Serban Cantacuzino CBE and poet Alan Brownjohn FRSL. Buzura is the pre-eminent novelist of contemporary Romanian writing, publishing several novels, editing magazines and engaging in literary tours and partnerships during a period from 1963 to the present day. Throughout those years he was engaged in a number of dangerous and difficult confrontations with the authorities, and after 1989, his confrontations with official opinion continued, morphing into passionate satires on the state of his region throughout its history. The novel “Report on the State of Loneliness” (Raport asupra singurătății) is a series of interlocking stories about the last hundred years of Transylvanian history, interspersed with the author’s reflections on identity and the approach of death. In part a lively political satire, in part a meditation on his own life, in part a passionate exploration of Balkan history, Report is a fascinating and illuminating read.